Bat - Intuition, illusion, rebirth, inner depth, communication, dreaming, viewing past lives. Messenger from the Underworld or your subconscious. A bat is a symbol of rebirth, every evening it emerges from the womb of the earth to live again in the night sky. Sighting a bat may mean that transformation is about to occur. At Samhain, flying bats could be the physical manifestation of the Souls of the Dead.Wear a bat charm or talisman to enhance spirit communication. Bear - Bears in general teach us to slow down and reserve our energies. Bear medicine also has to do with awakening from within. Bear teaches us that life's answers are no further than your own subconscious. There is no need to look outside of yourself when bear is nearby. Bears are also climbers and can teach us to reach new heights. Bears love honey and teach us to appreciate the sweetness life offers. Black Panther - Black Panther means that you are ready to move beyond Dogma, imitation and ritual, to experiencing spiritual realities directly, subjectively and personally. Your soul wants to grow. Panther brings you power, protection and guidance. Panther teaches you to always speak even when it is unpleasant. Panther is a shamanic guide, and to have panther as your spirit helper is a high blessing. The color black in shamanism is the color of the Creator, the state of the Void from which all things are created. With panther you are embracing the unknown and reclaiming your true power, you are conquering all fear of the "shadow self" and the "realms of darkness." It also means that you are seeing the truth through your own eyes, both physically and with clairvoyance. Boar - The boar is sacred. It is both cunning and ferocious. Bull - Strength and potency, the bull is a symbol of mobile power. Butterfly - Butterfly represents enlightenment and reincarnation. The transformation from caterpillar to a butterfly is nothing short of magical. Butterfly symbolizes a transformation which has taken place and you have already experienced an awakening or enlightenment. Butterflies as totems represent light, color, and joy. Notice the coloring of the caterpillar or butterfly totem that shows itself to you and study the significance of these colors for additional messages. Cougar - Cougar is a spectral figure that prowls the night, with yellow eyes burning bright, watching the story of Humanity unfold. Cougar gathers wisdom through experience and courage. With a chilling scream cougar pierces the veil between the worlds. Cougar is a loner and a messenger of the other worlds. The lesson cougar brings is the proper use of power and cougar guides us to the quest within. Cougar's element is Earth, and cougar is an emissary and leader. Crane - The crane is the bird of the Moon, magick, shamanic travel, secrets and reaching deep mysteries. The crane also represents the logical mind as well as patience while healing occurs. Cranefly - Purpose, balance, introspection, resourcefulness. When the cranefly appears it means that we have successfully blended our sub-conscious and conscious minds. As above, so below. Crow - Crows are associated with magic and the power to manipulate physical appearances. Crows are commonly found all around the world and remind us that magick is everywhere. Because of its affinity with life mysteries and magic, the crow is seen in many shamanic traditions as the spirit animal of choice for those who use magic and have the power to manipulate the law of our physical universe. The dark blue-black color of crow's feathers are symbolic of the underworld and the power of deep inner transformation. The spirit of the crow will guide you and help you to develop your ability to sense subtle energy shifts within yourself and your environment. The crow will give you a "bird's eye view" of a problem or situation so that you may see things from a higher perspective. The crow spirit is fearless and determined, teaching us to develop our personal power and speak our truths. We learn from the crow to "caw" out a warning when our clan or family is threatened. The trickster crow always seems to be able to get away with what they're after. They are not above stealing a lunch or a shiny trinket left unattended. Crow reminds us that we must watch for the tendency to trick or manipulate others to get our way. Deer - The deer serves as a bridge between the wild and the tame. This is because the deer will often be seen on the edges of the wilderness it calls home. Deer will also venture into our roadways and gardens. When deer appears you may want to ask yourself if there is a wild streak in you that desires taming. Or, have you been too cautious lately and desire to take a walk on the wild side? Deers have acute senses, they are always on alert to keep themselves from harms way. Deer totem may appear when danger is lurking, it also serves as a reminder to be watchful and alert to potential harm. Deer are family oriented. When deer totem shows up as a buck it could be indicator that you may have strayed from your family's teachings. It may be time to re-evaluate important family values of your youth. The fawn is representative of innocence. This totem also teaches the importance of mother and child bonding. The doe's nature is to give love and protection to her young. The fawn is a cherished member of the family. As a totem deer reminds us the responsibility of parenting. Deer totem may appear when a woman is pregnant or when a new baby arrives to help you begin establishing family traditions. The energy of deer totem is gentle and loving. Goddess-company, we trail the truth. We guide and protect her children. We stand at the gates between the worlds. Faithfulness and Protection; the Dog is a symbol of the small becoming the great. People with this totem have great spirit and a great ability to love. People with a Dog totem are usually helping others or serving humanity in some way. Dog medicine embodies the loving gentleness of best friend and the fierce energy of protector. You will have a deep understanding and compassion of human shortcomings. Study the quality of the breed of Dog that has entered your life: is it a hunter, a protector, a companion, playful? Each of these qualities will give you insight into the qualities needed for your own life. A Dog totem is a great spirit booster. Dragon - (Lizards) Wealth, raw powers of nature, the treasures of the unconscious mind. Dragonfly - Dragonfly is symbolic of prosperity, good luck, strength, peace, harmony, purity, sub-conscious & the deeper mind. Dragonfly is a creature of the wind and represents change. Dragonfly reminds us to "know which way the wind blows" so that we may avoid stormy weather. The dragonfly has a beautiful, jewel-like coloring. The bright colors take time to develop, reflecting the idea that with maturity our own true colors come forth. Structures in their shells scatter and refract light, making them look iridescent green and blue. This ability to reflect and refract light and color has caused it to be associated with magic and mysticism. Dragonfly's magic is the power of light and all that has ever been associated with it. In Japan, dragonflies represent new light and joy. Dragonflies remind us that we are light and can reflect the light in powerful ways if we choose to do so. Life is never quite the way it appears, but is always filled with light and color. Eagle - Wisdom and long life, Keen sight, Knowledge of magick and swiftness, the eagle is a strong ally when traveling into new territory. Eel - Adaptability, Wisdom, Inspiration and defense. Fox - Fox has the ability to blend into the scenery. You have to be quick to see the fox, and even when you do it will disappear so quickly that you'll wonder if your eyes were being tricked. Fox is a keen observer, watchful of humans and other animals nearby, while at the same time keeping hidden or camouflaged from view. Fox is very nurturing and protective of its family. Fox can be a guide to the faerie realms because of the trickiness of a fox's appearances and disappearances. If you see a fox it may very well be an invitation to communicate with the faeries. The sighting of a fox may mean that you need to step out of the lime light for awhile. Take your cue from fox and fade into the background for awhile. Don't worry that your friends will forget you, the fox has a charming personality that is not easily forgotten. Frog - Fertility, health, honesty, Sacred to Hecate. Hawk - Clear sightedness, teaches how to receive and interpret inner and outer signals. Heron - Of the Moon and magick, shamanic travel, secrets, the logical mind, through the heron one can find magick in nature. Hummingbird - Messenger between the worlds. Reminds us of the beauty and wonder of the world, brings love and joy to our spirits, a messenger of hope. The wings of a hummingbird move in the pattern of an infinity symbol bringing the message of eternity, continuity and infinity with each beat of their wings. During a cold night, a hummingbird seems almost lifeless, but comes alive with the warmth of the sun. Hummingbird is a powerful symbol of resurrection. Magpie - Omens and prophecies. Otter - Enjoying life, recovering from a crisis, faithfulness, friendliness, and being helpful to others. The otter provides valuable assistance in the otherworlds. Owl - Self-truth, wisdom, vision, clairvoyance, astral projection, messages through dreams and meditation. Because they hunt at night, they are associated with secrecy and darkness. Owls are one of the native American totem animals and represent clairvoyance and insight. The Great Horned Owl is often referred to as Night Eagle. The owl is at home in the night and has great awareness of all that is around it at all times. It is a predator with sharp accurate vision and is symbolic of great intuition. It is the totem of those that can see into the spirit world. It has the courage to follow its instincts. Owl's medicine includes seeing behind masks, silent and swift movement, keen sight, messenger of secrets and omens, shape-shifting, the link between the dark, unseen world and the world of light. To the Celts the Owl is sometimes believed to represent the Cailleach, who is the primordial hag representing the Crone aspect of the Goddess. The Owl of Celtic lore is almost always female. The beautiful and Otherworldly Blodeuwedd was turned into an Owl for all time as a punishment for the attempted murder of her husband. Other stories speak of the great age of the Owl, or fear her as a messenger of death. The Celtic Owl can help to unmask those who would deceive you or take advantage of you. In Greek mythology the Owl was a creature sacred to Athena, Goddess of the night who represented wisdom. Athena had a companion Owl on her shoulder, which revealed unseen truths to her. The Owl had the ability to light up Athena's blind side, enabling her to speak the whole truth, as opposed to only a half truth. In Welsh mythology the Owl symbolizes death and renewal, wisdom, moon magick, and initiations. Arianrhod was capable of shape-shifting into a large Owl, giving Her the ability to see into the darkness of the human subconscious and soul. Arianrhod was able to move through the night spreading Her wings of comfort and healing to give solace to those who seek Her. Raven - Ravens are sacred to the Goddess Morrigan, they are very magickal creatures, their feathers are black as night and they are able to move between the worlds of the living and the dead. 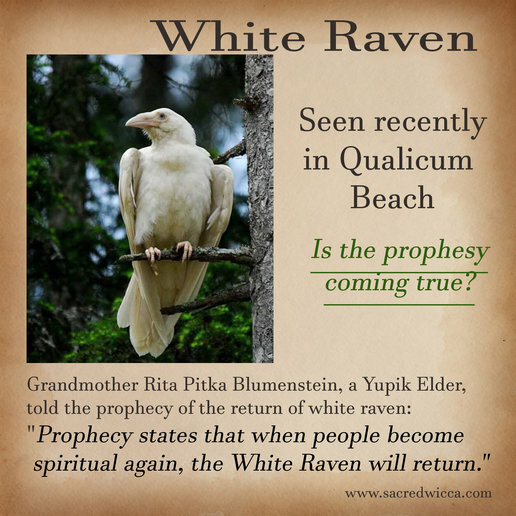 The Raven has great knowledge, she can effect transformations and create new realities as she chooses. Raven is a messenger. "If Raven appears . . . you are about to experience a change in consciousness. ... “Raven is the messenger that carries all energy flows of ceremonial magic between the ceremony itself and the intended destination." Medicine Cards: The Discovery of Power Through the Ways of Animals. Skunk -Skunk teaches that you do not need to be strong to be powerful. Skunks are confident about their place in the world and do not shy away from anyone. Anyone with skunk as a totem will also have a self protective demeanor. Skunks are not combative, it gives warning before it turns its tail on you. Snake -The ancient Celts approached snake symbolism from the behavior and life cycle of this magnificent creature. From the Celtic perspective, the snake was a symbol of secret knowledge, cunning and transformation. As far as the occult symbolic meaning in Celtic and other cultures, this can be connected to the sleuth-like ways of the snake. Disappearing in colder months and summoned by the sun marks the snake's connection to the shadow worlds with its successful ability to live within the dark realms for extended periods of time. Alternatively, the snake softly moves into the embrace of the sun, and so it encapsulates the ancient magician's creed of moving in perfect rhythm of natural forces. Squirrel - Energy, play, prudence, balance, socializing, preparedness, resourcefulness. When a squirrel is sighted it may mean that we need to take life a little less seriously, or it may be a reminder to balance work and play. Swan - Helps to interpret dream symbols, smooths transitions and spiritual evolution. Weasel - The Weasel totem family includes Ermines, Minks and Ferrets. This totem is a difficult power totem to have. It is a rare gift and great ability. Weasel medicine can teach you to find out secrets through the power of silent observation. Most Weasel people are loners, graceful, solitary and silent. They are very intelligent. People do not see their power immediately and often underestimate them. and offer assistance in your quiet or discreet way. Wolf - Loyalty, thirst for knowledge, solitary, perseverance, ruled by the Moon. Wren - The wren's song was used in divination, the power of strengthening and cleansing. The White Goddess - Owls - Symbology and Mythology.